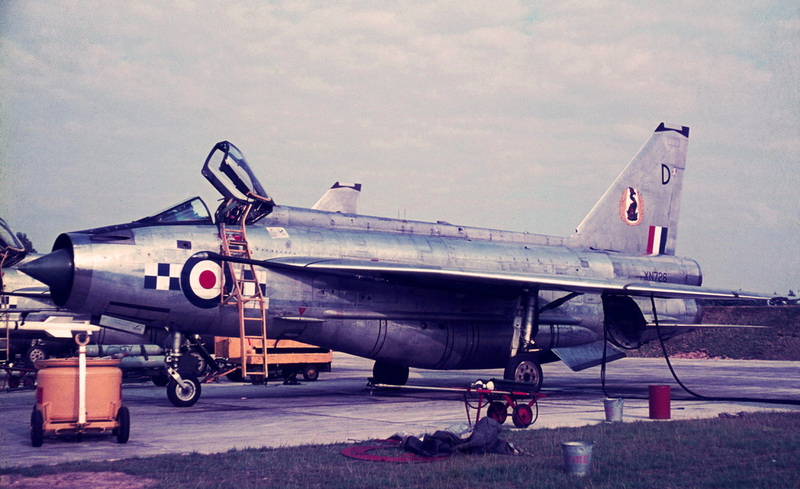 On 7th January 1963 English Electric’s Chief Test Pilot, Roland ‘Bee’ Beamont flew her for 55 minutes on the first of ten production test flights, and the following month XN726 became one of five F.2s delivered to the Air Fighting Development Squadron (AFDS) at RAF Binbrook, Lincs., coded ‘K’. Some three years later, and having flown only 277 hours, XN726 was delivered to Warton to be upgraded to F.2A standard on 19th October 1966. EE/BAC Test Pilot Jimmy Dell performed the first post-conversion flight eighteen months later on 28th March 1968, XN726 being the first F.2A to have Rolls Royce Avon 211 engines, and on 7th June 1968 she was delivered to 19 (F) Squadron based at RAF Gütersloh in West Germany, and coded ‘D’. The F.2A was broadly equivalent to the F.6, but the slightly smaller Rolls Royce Avon 211 engines were more economical than the Avon 302s of the F.6, better matched to the intake and still provided plenty of power. F.2As also retained nose-mounted 30mm cannon, so the whole of the large ventral tank could be used for fuel (10,200 lb), and unrefuelled sorties of over 2 hours duration were possible. The down-side was the less sophisticated version of the Airborne Interception AI.23 radar fitted, and the Firestreak pursuit-course infra-red seeking air-air missiles—rather than the collision-course Red Top missiles of later marks—but this was offset to a large extent by the superior Pilot Attack sight (PAS) which was integrated with the radar. 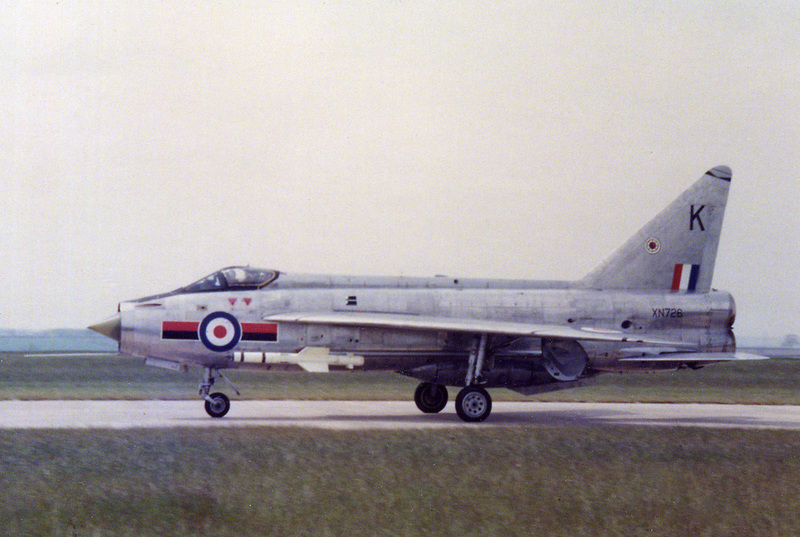 As RAF Gütersloh was very close to their ‘theatre of operations’ along the East German border, the F.2As did not need the wing-strengthening modifications of the F.6 to carry over-wing fuel tanks for overseas deployment, consequently the F.2As were lighter than the F.6s and many Lightning pilots assert that they were ‘the best of the breed’. 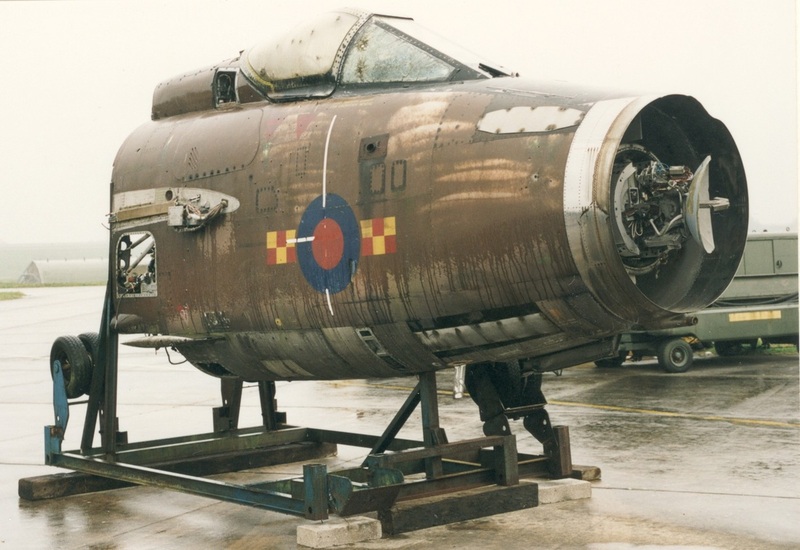 Ironically, on 27th March 1972, XN726 was herself struck by lightning on the ventral fuel tank, and the aircraft was taken by road to Warton for repair. Two years later, on 12th March 1974, XN726 took to the skies again, and on 13th May was delivered to 92 Squadron at Gütersloh, had the upper surfaces painted Dark Green and was coded ‘N’. 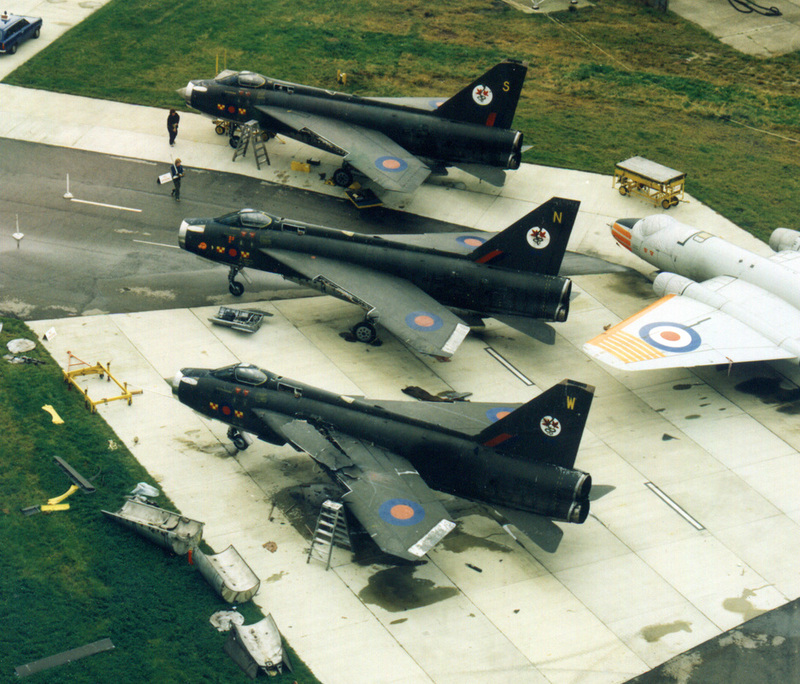 At Gütersloh's Open Day in July 1975, 92 Sqn flew a five-ship Lightning formation team, officially called Cobra Formation, but with tongue in cheek they became 'The Green Marrows'. XN726 carried a cartoon Lightning painted on a circle of Day-Glo vinyl on the port side of the nose which read ‘Fly Marrows’, and this has been replicated over the faded remnants of the original. 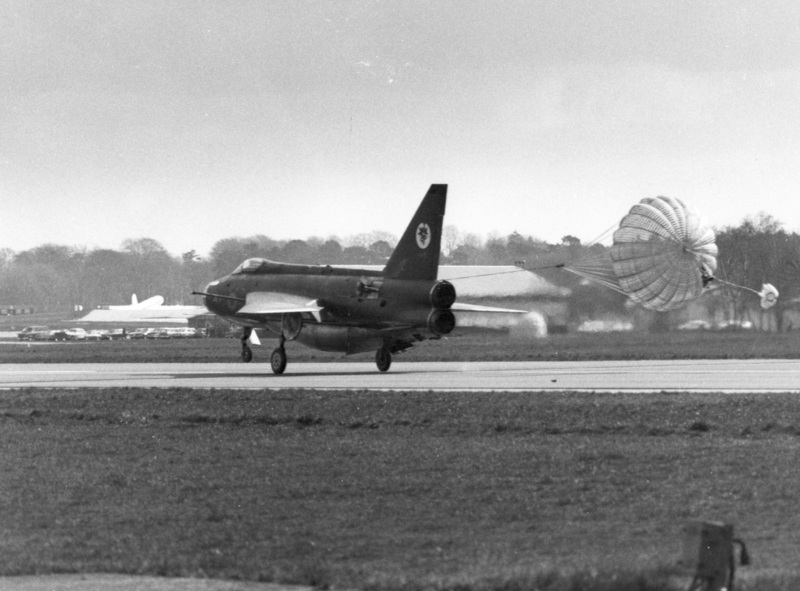 On 1st April 1977 Flt Lt (later Sqn Ldr) Jim Wild, whose name is still on the side of the cockpit, led a final Marrows flypast for 92 (Lightning) Squadron's disbandment. 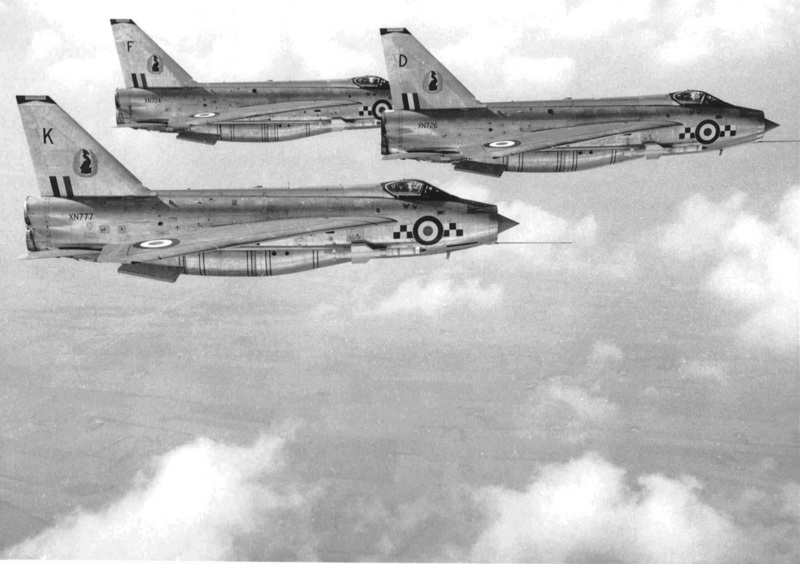 The five Lightnings in arrow formation were joined by a box-four of the FGR.2 Phantoms from Wildenrath which were to replace them. Three days later Jim delivered XN726, accompanied by XN727 ‘W’ and XN771 ‘S’, to the Royal Aircraft Establishment (RAE) Farnborough, prior to their being trucked to the Proof and Experimental Establishment (P&EE) at Shoeburyness, Essex, for weapons testing. 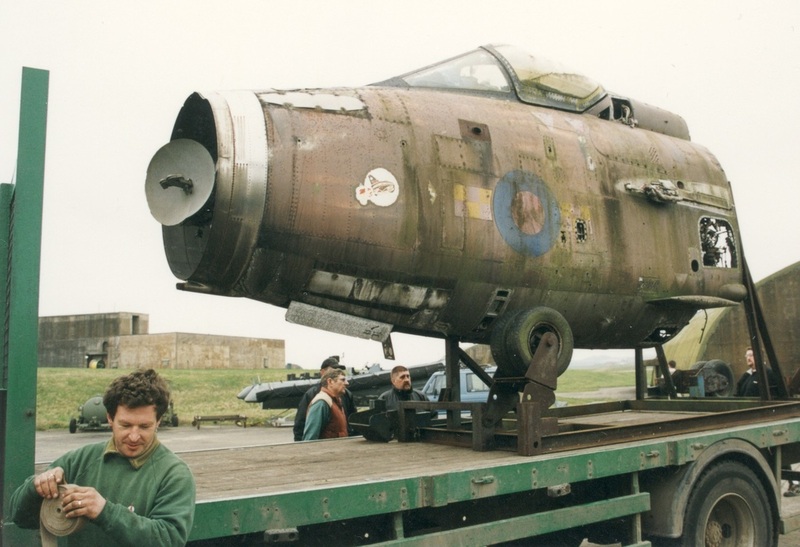 In 1993, prior to the remainder of the airframe being scrapped, Gavin Tennison removed the nose section on behalf of Nigel Towler. It was subsequently acquired by Hugh Trevor and on 1st April 2000 was delivered to what was then DERA (Defence Evaluation and Research Agency) Boscombe Down, on long-term loan to the Museum Project. 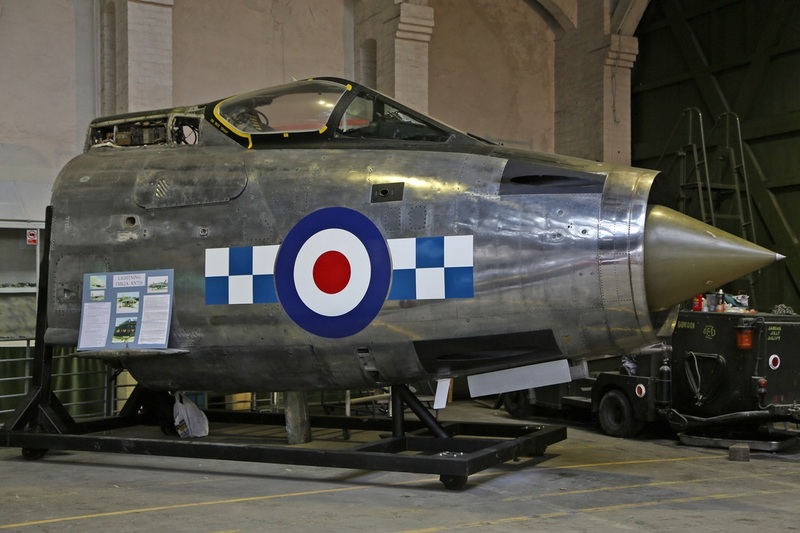 Squadron Leader John Sharpe MBE, then OC RAF Support Unit and director of the Museum Project, was keen to have a Lightning in the museum which had DERA history, Farnborough and Shoeburyness being part of the Agency (and subsequently QinetiQ). 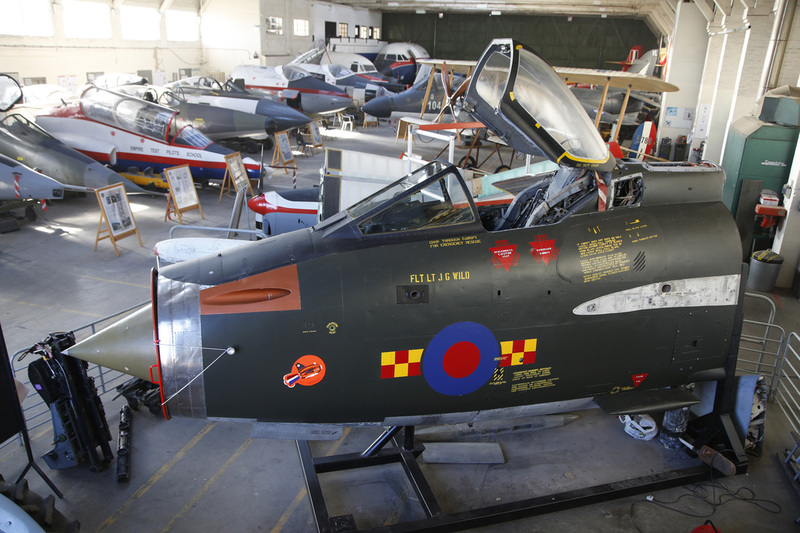 In mid-2012 the renamed Boscombe Down Aviation Collection (BDAC) moved into Hangar 1 at Old Sarum airfield, which enabled restoration to progress significantly. However, the cockpit/aircraft was in open storage for 35 years and still bears witness to armament testing, having over 120 shrapnel holes (possibly from Sea Wolf missile development) plus a smashed canopy and quarterlight, since replaced. Shoeburyness is home to plenty of wildlife, evidenced by the aircraft’s spine arriving full of owl pellets (containing the bones of unfortunate small mammals) and a nest with two (hatched) eggshells! The replacement canopy was rigged up to a hydraulic hand-pump by Kelvin Petty and the damaged Firestreak missile pack replaced. XN726 served with both Lightning squadrons in RAF Germany and in tribute the Lightning Wing at RAF Gütersloh, in the hot seat of the Cold War, the starboard side has been returned to the original metal finish she displayed when with 19 (F) Sqn while the port side bears the 'toned-down' dark green finish she wore when with 92 Sqn.